Max, our Christmas Eve helper at Sunset Foods today, sporting his festive holiday sweater. Merry Christmas, dear blog readers! I have to admit that I was feeling a little bit of a Grinch-like attitude earlier this morning–my holiday overload reaching the peak. But then the magic of the season returned with delight, at non-other than Sunset Foods here in Long Grove. As my husband and I shopped for last-minute items to complete our Christmas Eve dinner, we smiled at the crazy holiday sweaters being worn by the employees. 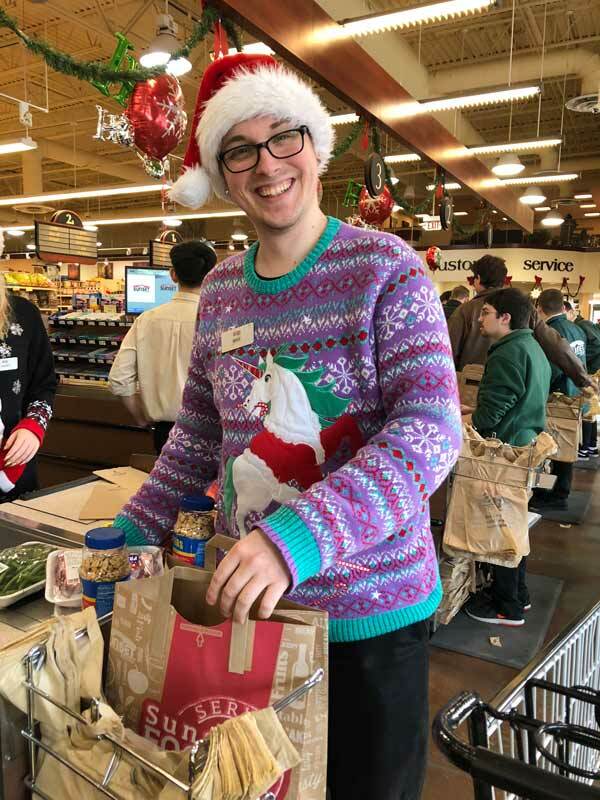 I would like to publicly thank Max, for not only bagging our groceries proficiently, but for showcasing the most colorful, creative, cute and clever sweater I’ve seen in my rounds of holiday festivities this year. Pictured above, the chic knitted pullover in a purple and teal snowflake pattern featured not only a Christmas unicorn clutching a candy cane in it’s mouth, but was festooned with blinking lights! (Unfortunately this didn’t come through in the picture, but believe me, it was brilliant!) As if that wasn’t enough, when we stopped by the Starbucks drive-thru on the way home, our drinks were free because a generous elf had gifted everyone in line behind him. Goodwill towards others abounded this afternoon in Long Grove, and reinforced to me what I like best about this time of year. Happy Holidays! 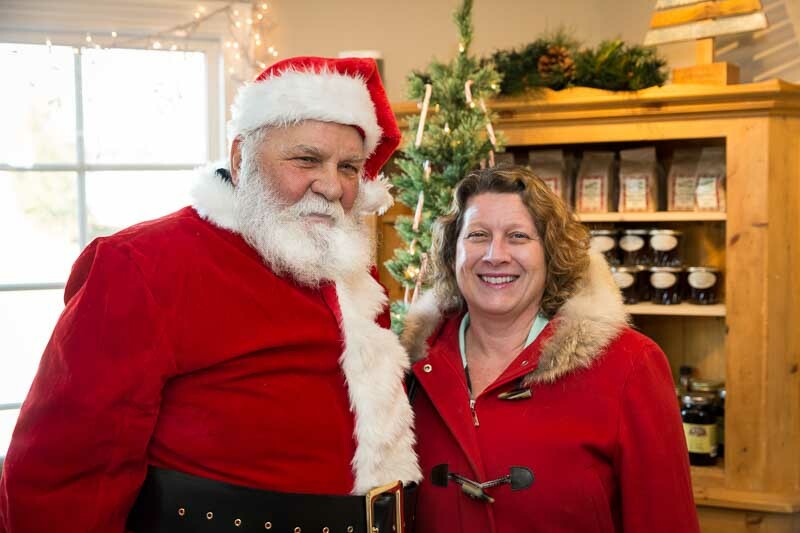 Sharing a laugh with Jolly Old St. Nick this morning at the Long Grove Coffee Company. Feeling virtuous after surviving my morning strength training session, I stopped by downtown Long Grove to reward myself with an eggnog latte (I know…not as nutritious as a smoothie…but ’tis the season!) and what to my wondering eyes did appear–Santa! Seizing the opportunity for an interview, I spent a few minutes basking in his holiday glow and finding out what was up for the day. Santa gave his reindeer this sunny Saturday off as he claimed to have driven himself to Long Grove, cruising down our newly resurfaced Old McHenry Road in his convertible, with the top down! I guess our 30 degree temps might feel tropical to someone acclimated to the North Pole. I asked him what kind of cookies he would like us to leave out this year on Christmas Eve, and get this–he is cutting back on the calories this holiday season and working out five times a week! Kudos to Santa for being a role model for healthy living, even though I still could not resist the temptation of the eggnog. Visitors to Long Grove will get numerous chances to see Santa as he is spending the entire day in town, greeting families and listening to children’s wish lists at various shops and restaurants. The top of my wish list? Seeing our covered bridge restored. Tonight Santa is paying a special visit to the Historical Society farmhouse, to lead the start of holiday carols at 6:00 pm for our annual Yuletide Sing. This family friendly event is free and will feature complimentary hot chocolate and fire pits for warmth. I invited Santa to be our guest later tonight at the Fred Astaire Dance Studio’s Holiday Ball, “Dance your way to Fred’s Chalet.” Alas, even though Santa loves to dance he has plans to thank the local volunteers who make up the CERT team of first-responders, at their Christmas party. No doubt about it, Santa is a busy man these days spreading hope, happiness and holiday cheer throughout the village. 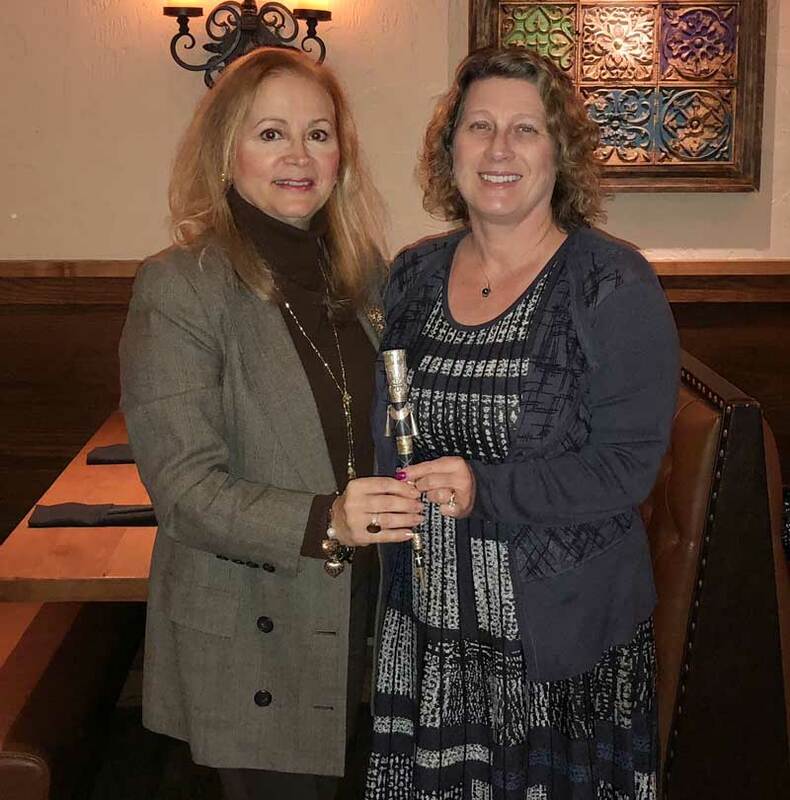 Village President of Kildeer Nandia Black (on the left) and former Village President of Long Grove Angie Underwood on October 24, 2018, holding a Mayor Stick from Peru. While I was serving as Village President of Long Grove a friend humorously told me, “What you really need, Angie, is a magic wand.” Whichever issue of the moment I was expected to fix (the roads, the budget, the downtown, the bridge, the Rt. 53 extension, the flooding, the rogue trustee, the dead deer on the side of the road, etc…) could be so much more easily resolved if I only had the ability to flick my wrist, point my staff and make it so. Of course the reality is that the key to solving most problems in government involves a mixture of time, money, collaboration, compromise, and a process that must be followed. It does sometimes take a bit of magic to make this happen. But to my surprise, I have discovered through my travels that there is at least one place in this world where the mayor of a village IS given a special stick. Peru, to be exact. While spending a few days in the town of Cusco, acclimating to the altitude before starting a trek to Macchu Pichu, my husband and I toured several historical sites and art galleries and I learned of the custom of the mayor stick. In ancient culture, the small mountain villages in the region surrounding Cusco depended on one another for trade and economic survival, as well as support in times of hardship. The Alcalde (mayor) of each village had a custom Palito (stick) which was handmade from chonta wood, a type of palm. These sticks were often traded or given to the mayors of neighboring villages during an annual celebration to encourage goodwill and prosperity. I absolutely loved this idea, and our tour guide was kind enough to find a store for me that sold these traditional mayor sticks. Recently, I was able to gift a Peruvian palito to my friend and former colleague Nandia Black, who is serving as the mayor of our neighboring Village of Kildeer. Our towns have collaborated and supported each other in the past and we hope this continues for many more years to come. The exchange of mayor sticks took place over Mexican cuisine at the new Uncle Julio’s in Kildeer, and not on a mountain top in the Andes, but the sentiment of peacefulness and kindness remains the same. Maybe it’s not really a magic wand, but I’d like to think so. 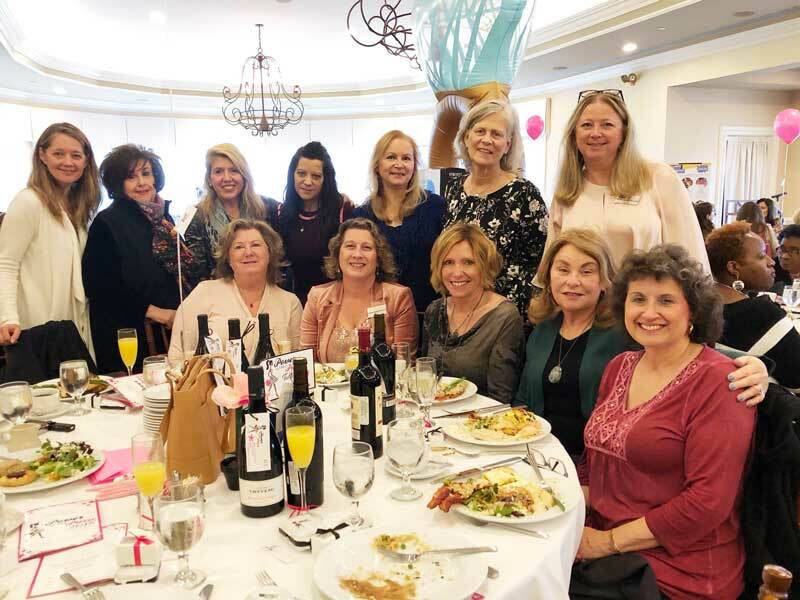 A table full of powerful and philanthropic women from Long Grove, Kildeer and Buffalo Grove helped raise funds recently for early childhood literacy in Lake County. On November 4th, Royal Melbourne Country Club in Long Grove was the location once again for Power of the Purse, the major fundraiser of Women United. As a member of this women’s affinity group of United Way of Lake County, I was pleased to participate by donating a gift basket of items showcasing downtown Long Grove, and sponsoring a table of twelve local ladies of influence. Two of these ladies even happened to be the mayors of neighboring Kildeer and Buffalo Grove–talk about harnessing some female strength! Long Grove played another major role in this fundraiser, as the Primrose School of Long Grove partnered with Women United to be the Platinum sponsor of the event. Owner Jennifer Wierzchon is a member of Women United, and together with families from the school helped teach the students the value of philanthropy and helping others by raising over $3,000. towards early childhood literacy at a spring school fundraiser. Long Grove businesses, families and ladies all came together today to rally around a worthy cause: to ensure that children living in Lake County’s most vulnerable communities are prepared for kindergarten and ready to succeed. Besides the important work of philanthropy and support, we did manage to enjoy some fun and friendship along the way. New purses were acquired, games played, prizes awarded, bling bestowed, and raffle winners announced. New books and educational toys were donated and a silent auction rounded out the day. The sold out crowd of 216 women raised a net total of $59,800 which will go directly to support early childhood literacy programs in North Chicago, Round Lake Beach, Waukegan and Zion. It was gratifying to play a small part in making this event successful again this year, and I was proud to see our community of Long Grove becoming even more involved this time around. Kudos, ladies, to a job well-done! 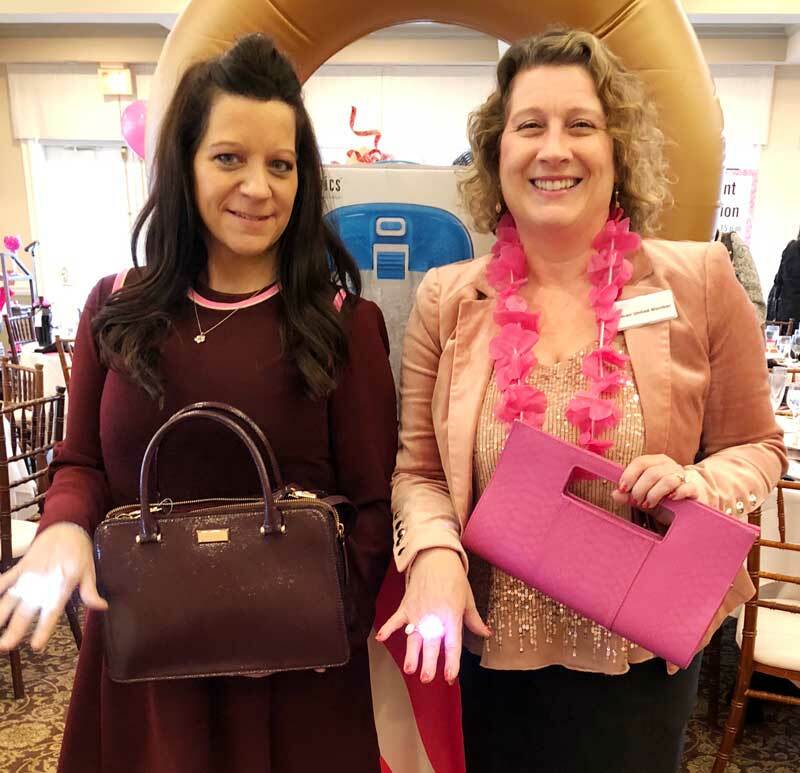 Julie Burger-Branham (on the left) and I, having fun and showing off our winning new purses and “bling rings” that glowed, but unfortunately did not win us any real bling! Since I happen to be gone from Long Grove on election day, I made sure to participate in early voting. 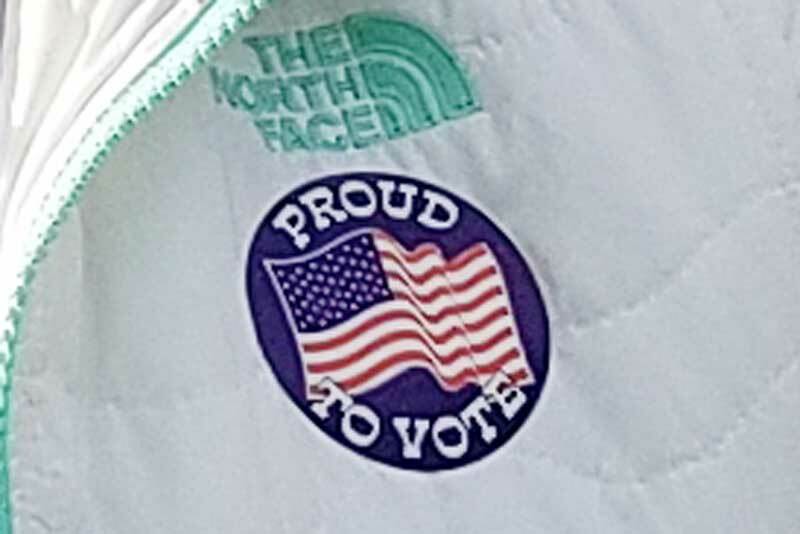 Here is my sticker to prove it! Wise words, indeed. Please vote! Visiting the Ashuelot, New Hampshire covered bridge on October 15, 2018. In the early 1970’s Robert Parker Coffin looked for some inspiration when designing a cover for Long Grove’s 1906 metal truss bridge over Buffalo Creek. 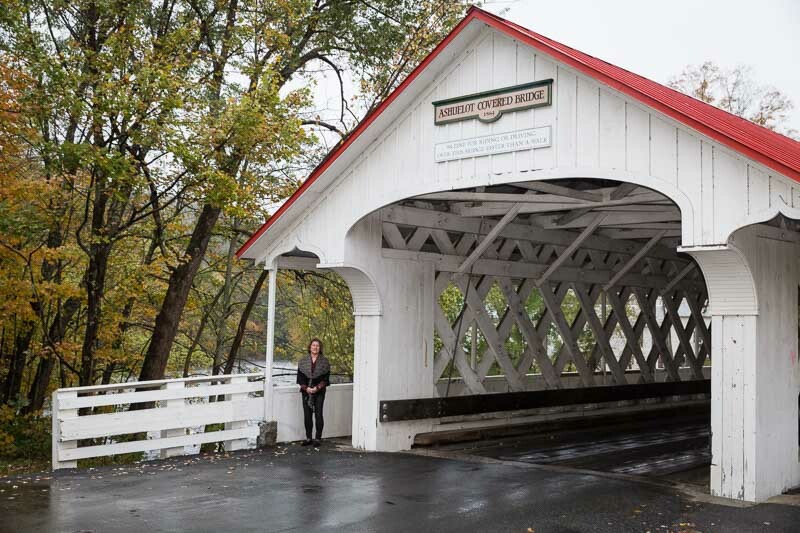 According to the story, the covered bridge spanning the Ashuelot river in New Hampshire provided some ideas to Mr. Coffin (an architect and former Village President) who oversaw the building of what later became the iconic village symbol in Long Grove, Illinois. This week, finding myself in New England on a vacation to enjoy the fall colors, I had to satisfy my curiosity by paying a visit to Ashuelot to view the original bridge. In addition to the beautiful autumn foliage, we spotted many wild turkeys as we made our way into the tiny town, spread along the riverside. The bridge itself is quite long, painted white with a red roof and a covered walkway on both sides. I did notice a striking similarity in the appearance of the entrance, and in the way that the posts and arches over the openings felt familiar. Another bit of nostalgia was the warm feeling of goosebumps that I got driving underneath the wooden covering from one side to another. I can’t wait until we are able to experience that once again in Long Grove. As we concluded our visit several cars of tourists arrived with cameras in hand, verifying the attraction feature this bridge also shares with our hometown symbol back in Illinois. 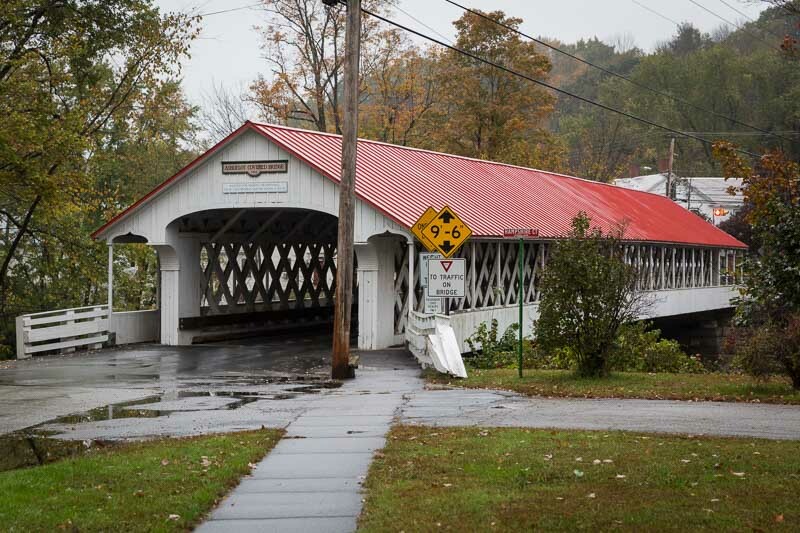 There is no doubt that covered bridges evoke a special kind of charm appreciated across the country. 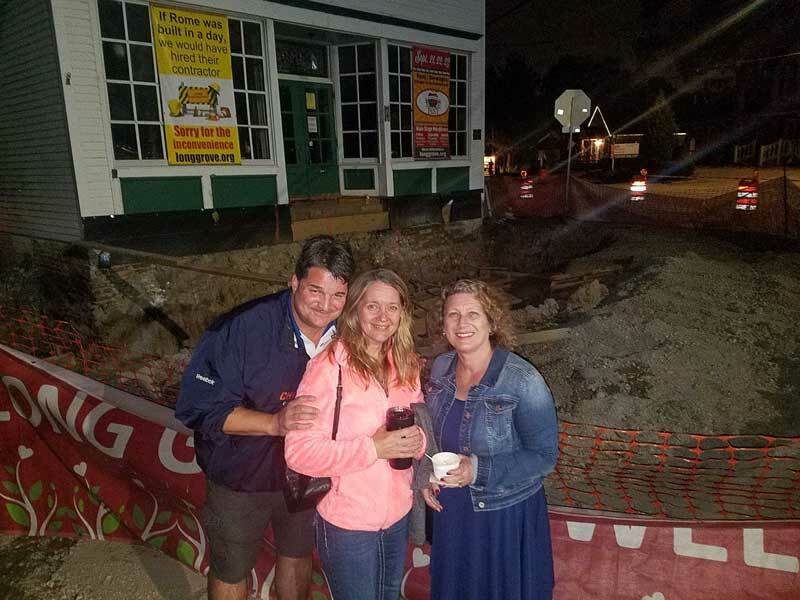 Long Grove residents Dave and Amy Gayton (on the left) join me in checking out the giant excavation at the crossroads in Long Grove during Apple Fest 2018. Anyone who has dared to venture into the Long Grove historic downtown in the past several weeks can tell you that it’s been a challenge navigating around all the various construction obstacles. Storm sewers are being installed, pavement dug out, building foundations reinforced, utilities relocated, roads temporarily closed–you name it–everything is converging into one giant mess of inconvenience. While there has been a fair amount of road work going on since April of this year, crews have recently ramped up the pace in an effort to complete as much as possible before winter sets in and puts an end to the road paving season. The Old McHenry Road reconstruction and intersection improvements project is being undertaken by Lake County DOT. Starting this coming Tuesday, October 9th, at 6 a.m. a portion of Old McHenry Road will be closed to all through traffic with reopening anticipated in November. Click here for more details and to view a map of the detour. All stores in downtown Long Grove have remained open during the construction, but as you can imagine, with torn up streets and sidewalks it has made getting from place to place an adventure. Shopkeepers that I spoke to this week are drawing on reserves of patience and optimism, and looking forward to brighter days ahead with freshly paved roads and sidewalks, new lighting and streetscaping, and a refreshed look to our historic crossroads. One big change on the horizon is the traffic signal soon to be installed on the corner of Old McHenry Road and Robert Parker Coffin Road. The construction this summer has been a hardship on not just the Long Grove businesses, but for all those who need to commute through the area en route to jobs and schools. In addition, the local non-profit community groups have had to alter or cancel activities and fundraisers due to the disruption. The Arts & Music Council held an abbreviated concert series this summer due to work scheduled near Towner Green. The Rotary Club was unable to hold their annual Heritage Run this September and have replaced it with an Octoberfest fundraiser at Buffalo Creek Brewing this coming Saturday, October 6th. The Historical Society has unfortunately had to cancel their popular Ghost Walk this year due to safety concerns with walking groups of families in the construction zone amidst the Halloween darkness, detours, and pedestrian restricted areas. A much smaller (but still spooky) family event is being planned at the farmhouse on the evening of October 26th. So what can we all do to help our village during the next couple of difficult months? Make it a point to patronize the downtown restaurants, shop for gifts in the local stores, pick up your morning latte at one of our downtown coffee shops instead of cruising the drive thru just because it is more convenient. Continue to contribute to our local non-profits, even if their signature fundraisers have been temporarily sidelined. By supporting each other our community can sustain through the construction disruption. In the meantime, pardon our dust, because one day soon this construction will all be in the past and the improvements will be well worth the wait! Mary Edly-Allen, Candidate for Illinois State Representative District 51 (on the left) is pictured with several members of VOWs (Voices of Women, strong) at a Long Grove gathering on September 28th. It has been a difficult week for anyone following the news headlines or televised senate hearings relating to the current supreme court nominee. I belong to a group of Long Grove ladies who gather on a weekly basis to discuss state, national and local politics. This week I was particularly grateful to have this caring, strong and smart huddle of female powerhouses to process together the events of the moment. But rather than wallow in the unpleasantness being created on the national political scene, this week we also focused on making a positive difference in the state of Illinois. Long Grove is represented in the Illinois 51st District. Last month, our former State Representative suddenly resigned from office due to a girlfriend’s allegations of misconduct. Running for this seat in November is candidate Mary Edly-Allen of Grayslake, and our group of women has been eager to hear more about her. Mary graciously accepted the invitation to join our coffee on September 28th, and we thoroughly enjoyed getting to know her, what motivated her to run for office, and her stand on the issues. Kudos to Mary for stepping up to run for office and giving us all hope for a better tomorrow. One thing that our opinionated group of individuals can all agree on is that having more women on the ballot, in elected office at all levels, is a step in the right direction. Instead of just getting frustrated by the current state of affairs, we can all do what we can to work towards positive changes. It starts by asking questions and seeking to become better educated, so that your informed choice is counted at the polls in November. May we know them, May we be them, May we vote for them! Pictured above is the feathered friend who has taken up residence in our yard this spring and summer. There are few things that I find more peaceful than spending time in nature. Luckily for me, I live in a place where it is possible to do that on a daily basis. But like so many of us, I get busy and over-booked and forget to really pay attention sometimes. This week however, I finally took a cue from a very observant creature. We often have hawks visit our yard, the adjoining prairie lot, and the creek and conservancy that border it. They can be spotted circling overhead or perched in nearby trees at all times of the year. Besides being majestic to behold, we love the hawks because they help keep down the local field mice population. And while I appreciate all of God’s creatures, every rodent snack a hawk snatches from my yard is one less rodent to keep out of my basement this fall. Happy hunting, hawk-eyed friends! This spring, my husband and I first noticed one particular hawk who seems to visit our yard more frequently, and who has a favorite perch on the top of a large evergreen tree at the back edge of our lot. It has been fun to watch her (I’m deeming it a her although I really have no clue) all summer long from the back windows and outside deck. Seeing her fly over the prairie or spotting her perched on a limb in vigilant watchfulness has been a happy reminder that we share our little corner of Long Grove with wildlife free to come and go. Or is she really as wild as we think? A couple of days ago we realized that nearly every morning around 8:00 am she is there, perched on top of the evergreen. Aaron goes out and fires up the John Deere for his 3 minute commute across the prairie path to his office. The hawk flies over him and perches on a tree in the hedgerow between the lots, then she hunts in the prairie after Aaron has effectively “scared up” her breakfast. It has not only been us who have been watching the hawk. She has been watching us, using her keen eyesight to observe our routines and patterns and learn just when to wait for her most opportune hunting moment. The hawk helps us to keep the mice population under control, but we help her to feed her family. How many weeks has it taken me to notice the connection? The hawk had it figured out months ago! There are so many lessons to be found in nature, sometimes we just have to take the time to really look. Picture of the damage to the covered bridge on June 27th, 2018, taken soon after the accident. The wooden covering has continued to slowly collapse in the days since. The long term work needed to stabilize, open the road to traffic, and repair the damage is still being evaluated. 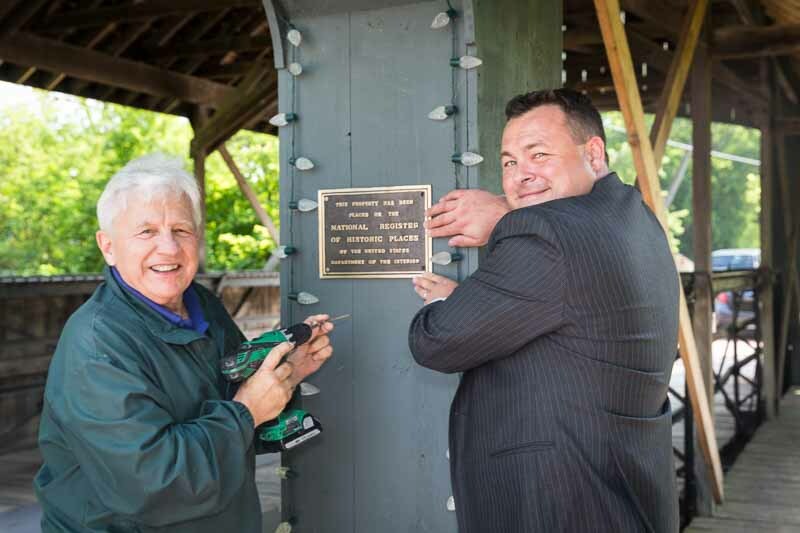 Former Trustee John Marshall (left) and downtown businessman Ryan Messner are shown installing the National Register marker on the bridge exactly one week before it was severely damaged. The recent news of the National Register status had seen major media attention in the Chicago area, and it was picked up by the Associated Press last weekend. Many individuals had reached out to the Long Grove Historical Society following the National Register news with congratulations and elation over this story. The feeling in the community had been one of pride and happiness. As disheartening as the past few days have been, I know without a doubt that this community is resilient, and that we will rally and come together once again to save our bridge and restore it. Many, many passionate people have worked very hard to get the bridge on the National Register, and we will work just as hard to have that long-awaited celebration when the repairs are completed. I am looking forward to it! In parting, be heartened by the lovely image below, recently taken and sent to me by someone who grew up loving this bridge and loves it still today. Truly, a picture is worth a thousand words. 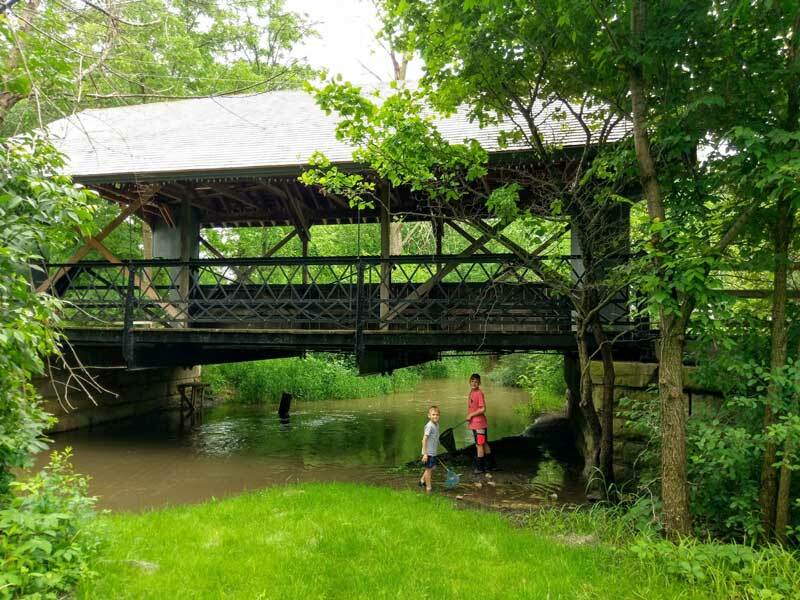 A beautiful picture of local boys searching for crayfish in Buffalo Creek under the bridge, taken and sent to me a few days before the tragic accident.